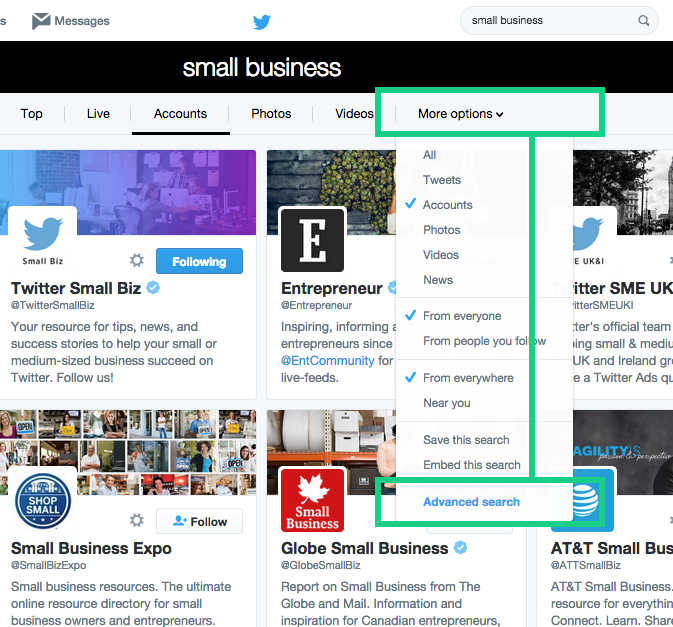 This week, via Twitter's Small Business Blog, a new post was released which provided an overview on how to use Twitter's advanced search parameters to maximize your Twitter search efforts and locate the content you need. Which is great - Twitters never all that good at communicating the inner workings of their system and how to use their tools effectively, so any information on this front is helpful. But the detail provided was a little too basic and didn't go into the full depth of what's possible through the platform's advanced search features. So we decided to put together our own - a listing of how you can utilize Twitter's search functions and qualifiers to make the most of the network's stream of real-time conversation. And what's more, we'll also go over how to use those search parameters to set up constant monitoring to keep your brand on top of the latest news as it happens, via tweet. By now, everyone pretty much understands how Twitter's basic search works - there's the search bar at the top of the screen (highlighted in the above screenshot), you type in your terms and go. Simple. "You could see every Tweet from today, by someone in your city (or another location), with the phrase "what should I have for dinner?". You could filter to see everything a particular account (maybe your competitor) Tweeted in October. You could find a Tweet by remembering a phrase in it - even if you forgot who Tweeted it. You could find all the users who have "fashionista" in their bios and so much more." To locate Twitter's advanced search, conduct your search as normal then, once you're in the results screen, click on the 'More Options' tab at the top right. This will open up a new drop down menu with a range of additional tools. Go down to 'Advanced Search' at the bottom and you'll be taken to this screen. As you can see, the breadth of options is already pretty comprehensive through this tool. Searching for all tweets mentioning your key terms is often counter-productive because there'll be so many off-topic and unrelated mentions across the network, so the 'Exact phrase' qualifier is one that definitely comes in handy, enabling you to specify the exact combination of words you're looking for. 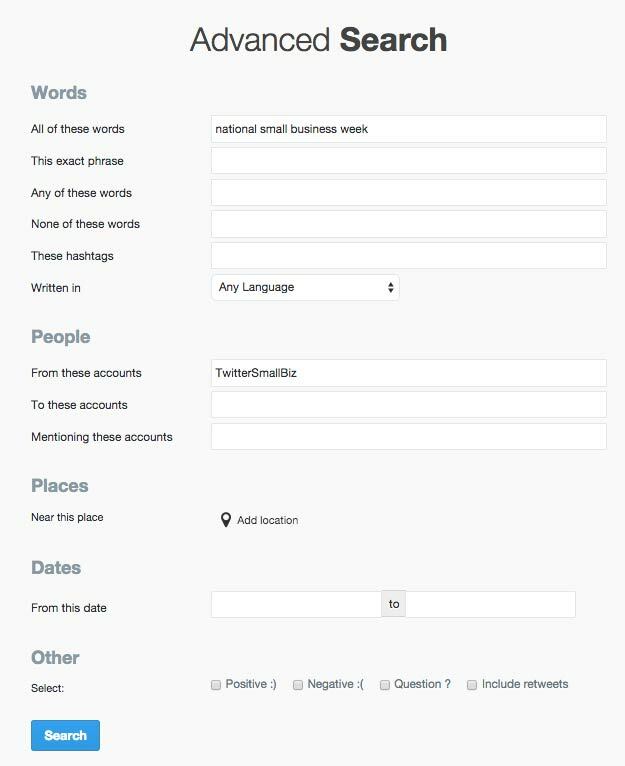 You can also put in additional qualifiers like exclusions and hashtags. Exclusions come in handy when your terms can be used in varying contexts - you might want to look up mentions of "shades" for example, in the context of sunglasses, but you do that search and you're going to be inundated with "50 Shades of Gray" mentions. For this, you might exclude the terms "50" and "gray", giving you a much more relevant list. You can also narrow down your search to specific accounts, which is helpful when you're looking for that cool GIF that your friend posted but can't remember exactly what they wrote or when they tweeted it. 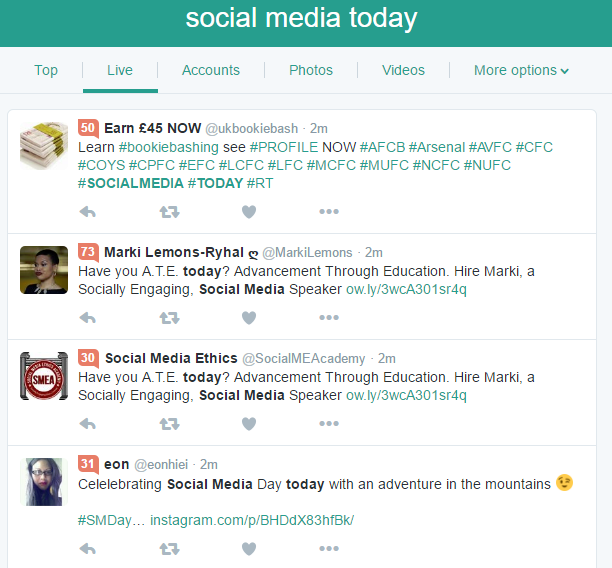 It also enables you to check out what your competitors are tweeting and whether they're discussing certain topics, trends, hashtags, etc. Using the 'To these accounts' and 'Mentioning these accounts' qualifiers, you can see your history of interactions with a person or brand - or anyone else's, which can also be beneficial in monitoring Twitter for opportunities. 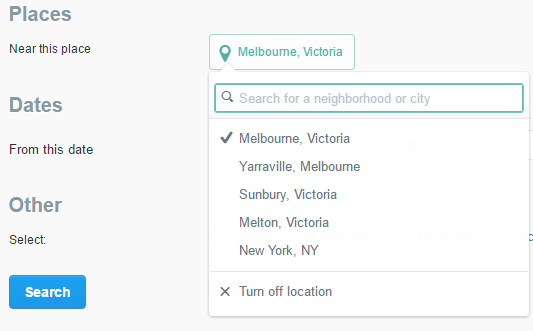 There's also the location filter, which enables you to search for tweets sent from whatever city or region is relevant to your search (you need to have location services switched on for this to work). You can also search within a certain time frame and use the "Positive", "Negative" and "Question" qualifiers based on language detection terms - i.e. a tweet using your search term/s and "great" would likely be deemed positive, while the same with "bad" might come up in the negative list. Automated sentiment detection is never perfect, and neither are the question searches necessarily (which includes any tweet with a question mark and your term/s), but used with all the other various measures, you can come up with pretty narrow focused search parameters than can help make more sense out of the 6,000 tweets being sent every second. Worth noting, too, that when you do conduct a Twitter search, the default listing will be the 'Top tweets', which is based on the popularity of the tweet itself, the creator, their relationship to you, etc. If you're looking for an unfiltered view, you need to switch to the 'Live' tab. In terms of how Twitter defines 'Top Tweets', Twitter's always developing their algorithms with a view to showing you more relevant content - this is most notable in their new feed algorithm which highlights the most relevant tweets that have been posted since you last logged on, based on your historic interests and audience. As their algorithms advance, so too does their search system, though that's only relevant if you're looking for content most likely to be relevant to you. If you're searching for information more broadly, it's worth noting that 'Top tweets' is likely not what you're after, 'Live' will generally be more relevant. While Twitter's readily available basic and advanced search measures are definitely beneficial, there's actually more options at your disposal than what you can see in the tools provided, and they can be used beyond Twitter's search field alone. When you conduct an advanced search, have a look at how the terms you've used are actually listed in the search field at the top right of screen (on desktop). There you can see exactly how the search term is composed, in text form, which shows you how the various qualifiers are listed. This is important because it enables you to use those terms in other contexts - for example, you can take that search and paste it directly into a stream in Tweetdeck or Hootsuite, enabling you to keep track of new, relevant tweets as they're posted without having to repeatedly re-enter the query. That column will remain active in TweetDeck, enabling me to get an update every time I log on or refresh, highlighting the relevant mentions straight away. Would show me all the tweets using the exact phrase "social media today" tweeted over the last month near Washington which garnered a minimum of 20 re-tweets. While this is just a random example, you could use this if you were visiting a certain region and wanted to target the most active and influential Twitter voices on a certain topic. 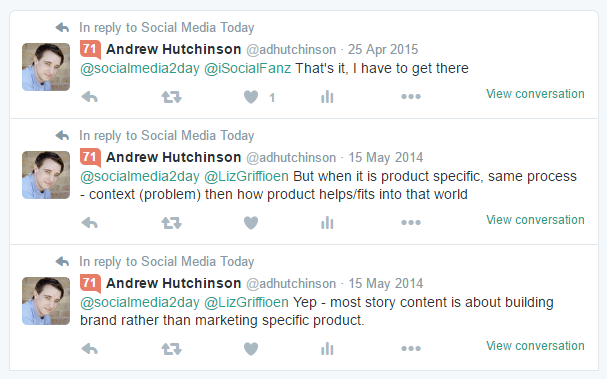 And really, the possibilities of Twitter's advanced search capacity are almost endless, there's a heap of ways you can chop and change your parameters to find the most relevant tweets, enabling you to stay on top of the evolving Twitter conversation. We've written before about Twitter's under-rated utility and how it can be used to keep your finger on the pulse of what's happening - Twitter's advanced search operands are what enable you to do this - and what's more, you don't necessarily even have to pay for an expensive monitoring system to keep track of relevant mentions. 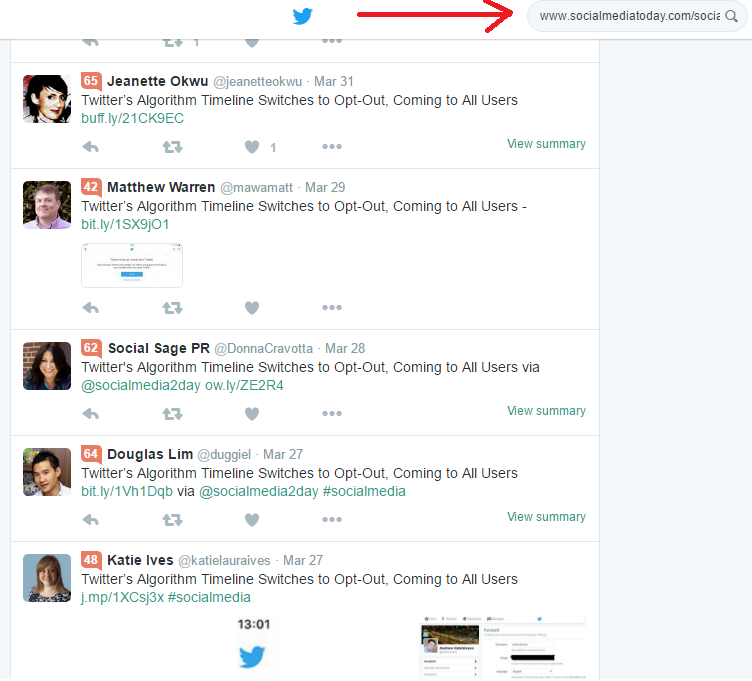 In addition, you can also use Twitter search to track all mentions of a particular URL or blog post. 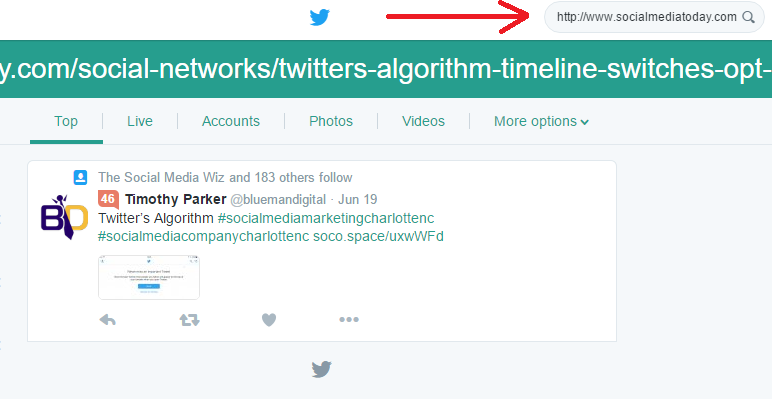 To do this, you need to search for the URL without the "http://www." at the beginning. It shows me every mention of this URL - even those included within shortened links. 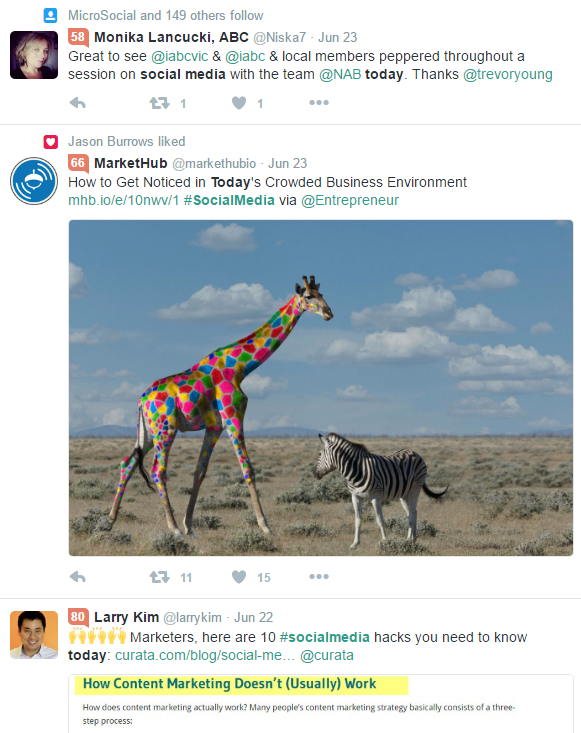 As noted, using Twitter's additional qualifiers can greatly refine and enhance your on-platform search efforts. There are half a billion tweets sent every day, and locating the signal amidst that mass of noise can be tough, but there's a heap of value in there waiting to be fished out - you just need to build the right net to do it. Using these advanced qualifiers and saving them to TweetDeck or another social media management tool, you can build your own tracking system that will enable you to stay on top of relevant tweet mentions and respond to them fast - ideally, faster than your competitors. It takes a bit of work to narrow down the specific terms you need to track, but I'll leave you with this final example as an indicator of what can be done once you have put in that initial research effort. The US Geological Survey uses Twitter conversation to track earthquake activity, and they've found that Twitter data can be a highly accurate measure of seismic activity. But, of course, in order to track the right data, they need to locate the relevant tweets out of the mass of related mentions and noise. "They found that people Tweeting about actual earthquakes kept their Tweets really short, even just to ask, "earthquake?" Concluding that people who are experiencing earthquakes aren't very chatty, they started filtering out Tweets with more than seven words. They also recognized that people sharing links or the size of the earthquake were significantly less likely to be offering firsthand reports, so they filtered out any Tweets sharing a link or a number. Ultimately, this filtered stream proved to be very significant at determining when earthquakes occurred globally." They did the research and found what works, and now they have an accurate stream of relevant data which they can track in real-time. What terms and queries would be relevant for your brand?